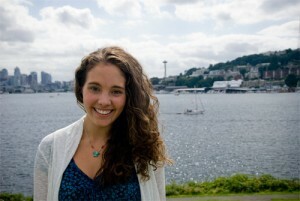 Genevieve (Gennie) Gebhart is the UW’s most recent Luce Scholar. Genevieve (Gennie) Gebhart, a senior Honors student majoring in international studies and economics, was recently selected as a 2013-14 Luce Scholar. A graduate of Mercer Island High School, Gebhart is one of 18 students nationwide to receive this scholarship this year. The University of Washington is one of two Pac-12 institutions with a Luce Scholar this year. The Luce Scholars Program is a major national scholarship awarded to fewer than 20 students each year. More than 160 candidates were nominated by 75 colleges and universities this year. The program is designed to raise awareness of Asia among young American leaders and funds a stipend, language training, and places scholars in professional worksites in Asia. A unique element of the Luce Scholars Program is that the foundation seeks students with little to no experience in and of Asia. Students who have had broad experience in Asia or who are majoring in Asian studies, for example, are ineligible for the scholarship. As an undergraduate, Gebhart’s accomplishments extend well beyond the classroom and include research projects and leadership accomplishments. She has been on the Dean’s list every quarter since entering the UW in 2009; earned a Mary Gates Research Scholarship to research eating disorders, family dynamics and film in southern Italy; received Mary Gates Leadership Scholarships for her work developing the women’s program of the Husky Cycling Club and then serving as the club’s president; was the youngest-ever recipient of the UW Libraries Research Award for Undergraduates; and was selected for several additional scholarships. As if that weren’t enough, Gebhart is also a vocalist on the Grammy-nominated recording of “The Shoe Bird” with the Seattle Symphony. Gebhart’s interests have led her on a multidisciplinary path culminating in a plan to pursue international librarianship and address issues of information access. She wrote, “My multidisciplinary education has been one big string of surprises. I never could have predicted that I would be involved in economics, or film studies, or library sciences—and, I never could have predicted that I would be doing those things all at once! My education at UW has made me more open to different fields and ways of doing things, and it’s made me more perceptive of unexpected connections among all those fields. For something like information sciences, this is invaluable—what librarians do is so multidisciplinary and requires so much intellectual flexibility. Gebhart’s interest in libraries was inspired in part and wholly supported by her work in UW’s library system. “It’s the people I get to work with that have really role-modeled for me the many ways in which a librarian can be a force for the greater good,” she notes. In addition to her academic pursuits, Gebhart enjoys creative writing, swimming, hiking, and is studying Italian, French, and Latin. Read a Q & A with Gebhart here. Learn more about undergraduate opportunities to earn national scholarships. Learn more about the Luce Scholars Program.